(Yorkville, Illinois, July 9, 2018……) At Aurora, we’re Investing in American Manufacturing and celebrating that investment with an old-fashioned lawn picnic at our Yorkville, Illinois, manufacturing plant today, July 9, complete with hot dogs, bratwurst, apple pie and a raffle for baseball tickets. Employees, customers, friends and local officials have been invited. Three years ago, Aurora made the decision to expand US operations by investing in a new plant at home with state-of-the-art, world-class technology to help our customers keep pace with the dynamic, quickly-evolving markets we saw opening in the US and abroad. Aurora has been successful and today’s picnic kicks-off a six-month program focused on the lessons learned and the multiple benefits to our customers here and abroad, of our investment. Today also celebrates the value this has brought to the local communities, regional economies, US supply chains and global industry sectors we serve. Supporting American Manufacturing has always been part of Aurora’s mission as a subsidiary of Meridian Industries, Inc., LaTurno added. Photos and videos of today’s event will be available throughout the day. Media Notes: Aurora Specialty Textiles Group, Inc. is a global leader in coating, dyeing and finishing of both woven and non-woven fabrics. Based in Yorkville, Illinois, U.S.A., the company has a 132-year tradition of innovation and in 2015 invested in a new state-of-the-art, wide width coating and finishing line, and a new facility, that dramatically expand their ability to serve customers. Products include digitally printable textiles through Aurora’s Northern Lights Printable Textiles line, specialty home products, industrial products and tape products for a wide variety of industries. Aurora Specialty Textiles Group, Inc., is a Meridian Industries, Inc. company and ISO 9001 and ISO 14001 certified. (Yorkville, Illinois, June 12, 2018……) Aurora’s Expressions Semi-Gloss and Matte products, in addition to Aurora’s Accent Knit fabrics, were recently on display at the IT Supplies networking reception held in cooperation with the Digital Textiles Printing US 2018 conference, June 7 & 8, in Chicago. Organized by Smithers Pira, Digital Textile Printing US 2018 took a close look at advances in the industry as well as the future of textile digital printing. Presentations included topics on workflow management, color management, new inks, new printing technologies, sustainability and the impact of new advances in the digital printing of textiles for home décor and soft signage applications. At the IT Supplies networking reception, several of Aurora’s printable textiles were used by printers to demonstrate their printing technologies. This includes Aurora’s popular Expressions Canvas products, which were being printed on Canon’s new Oce´ Colorado UV printer and HP’s 360 latex printer. Meanwhile, Aurora’s Accent Soft Knit 5 was being printed in a dye sub transfer demonstration. Mark Shaneyfelt, Aurora’s Marketing & Sales Director for Printable Textiles, said the IT networking reception was a great showcase for several Aurora products specifically developed to optimize color and print output at manufacturing speeds on the industry’s latest digital printers. Shaneyfelt and Marcia Ayala, Vice President of Aurora, attended the conference. “It was a great forum to network with others …. and learn about challenges and new technologies in the industry,” said Ayala. She added that the growth in printable textiles “was consistently reported as double-digit per year,” and soft signage is a significant part of that growth. NIU Industrial and Systems Engineering Spring 2018 Senior Design Project sponsored by Aurora Specialty Textiles Group, Inc. won awards at the NIU School of Engineering and saved the company money while improving ergonomics. (May, 2018, Yorkville, Illinois, USA….) Tasked with reducing changeover times and improving ergonomics at Aurora Specialty Textiles Group, the team of Industrial and Systems Engineering graduates beat 38 other teams in NIU’s capstone competition. Made up of Alex Hurtado, Anthony Skrapits, and Alison Ward, the winning Range II Changeover Optimization project won both the overall Award of Excellence for the Engineering school and first place in the Industrial and Systems Engineering category. The NIU team was able to reduce changeover time and improve the cleaning process by using lean manufacturing tools and engineering skills. The team of NIU Students and Aurora employees identified tasks that could be done before, during and after changeover to reduce time. The NIU students also analyzed the ergonomics of employees doing the cleaning. Those findings were implemented during the semester. The result was changeover time reduced by at least 30%. The students also made changes to cleaning methods to make it more ergonomically friendly to employees. New cleaning tools and methods not only made the task quicker but prevented employees from having to “crouch in these weird positions for a long time,” Hurtado said. “It was a win-win situation for the NIU students and Aurora Specialty Textiles”, Ayala said. Congratulations to Alex, Ali, and Anthony on winning the awards that recognize the outstanding work and results from their project. The NIU team thanked Aurora for the cooperation and team work needed to make this project a success. (April 25, 2018, Yorkville, Illinois, USA….) With new textile markets and technologies evolving quickly, Aurora Specialty Textiles Group, Inc. (Aurora) is ideally poised to help companies develop new products that help them keep pace with market trends. With this capability in mind, Aurora is hosting a booth at Techtextil North America 2018 to meet with new and existing customers to discuss new product development, custom collaboration and Aurora’s next-gen, wide-width bleaching, coating, finishing and calendering technologies. Attendees are invited to visit Techtextil Booth 2846 May 22-24, at the Georgia World Conference Center in Atlanta, Georgia, USA, to learn about the many market segments that can benefit from Aurora’s advanced manufacturing operations and R&D expertise. Market segments that have begun to benefit from Aurora’s advanced product development and manufacturing capabilities include print media, nautical, home décor, bedding, outdoor and much more. Existing and potential customers include companies in the Buildtech, Hometech, Indutech, Mobiltech and Medtech Application Areas at Techtextil. The Product Groups for Aurora at Techtextil include Woven Fabrics, Knitted Fabrics, Nonwovens, Coated Textiles, Canvas Products and Development. Aurora’s attendance at Techtextil North America 2018 follows two years of growth and expansion following the formal opening in the fall of 2016 of Aurora’s vast, new, state-of-the-art manufacturing operations in Yorkville, Illinois, USA. In step with that move into the future, Aurora also launched a new brand logo, tag line and Mission Statement, and in 2017 announced the roll-out and full commercialization of their entire Expressions Canvas product line. Aurora’s premium Expressions canvas line — which is quickly becoming known as a perfect option for signage, art and home décor — is available in four different gloss levels. All of the products in the Expressions line are treated with the proprietary Expressions coating engineered by Aurora’s North American R&D group to maximize color pop and visual clarity on today’s latest generation latex, solvent/eco-solvent and UV printers. Aurora’s Innovation Lab, R&D team and manufacturing operations are in North America, assuring best quality, ease of communication, potential cost savings, reliable turn-around times and the ability to order product as needed. Show visitors can also follow Aurora on Twitter and Instagram during the show (see social media links below). 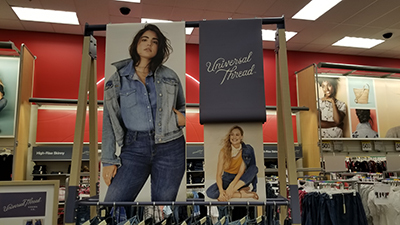 Recently, Aurora Specialty Textiles Group (Aurora) filled a large order from a commercial printer, contracted by Target Corporation to print in-store signage for their spring 2018 women’s denim roll-out. The fact we could respond quickly and fulfill this order in a very short time frame was a major reason we received the order. Target’s signage was printed on our newest product, Expressions Canvas. What made this especially unique was the fact that the width supplied to the printer (122”) was far wider than the comparable canvas products that any of our domestic competitors could process or provide. The picture to the left was taken at a Target store just one mile from our Yorkville, Illinois, USA, plant, but stores throughout North America have retail banners printed on the same Aurora-made product. We expect to participate in future point-of-purchase promotions by Target and other retail outlets.